When I receive a private message asking about my scleral lens, I like to include some background about my facial paresis in my response. Oftentimes this entailed including a link to my MVD Diary at the Hemifacial Spasm Association of America website. A few days ago I discovered that the site is no longer available. That website was a godsend for me as I weighed treatment options for my hemifacial spasm and I am sorry that it is no longer there for the 10,000 persons who will be diagnosed with HFS this year. The dozens of MVD diaries were invaluable, as were similar entries for various medications and Botox treatments. Fortunately I still have my original diary file and updates. I am posting it here both in the hope that it may help someone searching for information and as a personal reminder of just how far I have come since surgery. Surgical Location: Detroit Receiving Hospital, Detroit, MI (USA). My first symptoms started in the summer of 2003, during Vacation Bible School where I was volunteering as the cookie lady. I had slight flutters under my left eye, nothing much, but somehow different from stress flutters. I did a quick Internet search, which turned up magnesium deficiency as a possibility. I started taking magnesium supplements, and the flutters disappeared. The next summer, 2004, I was taking my eldest daughter on a college visit tour, and the flutters reappeared, only stronger. Magnesium did not make them disappear this time, but relaxation breathing would stop them, reinforcing my belief that they were caused by stress. By November 2005 twitches were occurring daily, usually at night, and I mentioned them to my ophthalmologist. He asked me to let him know if my cheek or mouth became involved. By the next week, they had. During my annual appointment, I brought up the spasms with my GP. She prescribed Inderol and said she would refer me to a neurologist if they did not resolve within 30 days. Meantime, I did some more research on the Internet, this time discovering the Hemifacial Spasm Association website. I knew immediately that I had hemifacial spasm, and I was devastated. By the way, I think that the Internet is an incredible resource, and I thank God that I came down with HFS in the computer age. I am including pertinent websites in my diary wherever possible so that nobody has to replicate the research effort. The Wikipedia entry for HFS is not half bad. Our support site is listed there as an external link. In January 2006 I had a diagnosis of left-side HFS, and in February 2006 had a MRI to rule out aneurysm, tumor and MS (Multiple Sclerosis). I started a series of medications, including Baclofen, Neurontin, Klonopin, and Topamax. The medications had either no effect, or a slight effect that diminished over a short period of time. In addition, Klonopin caused sleepiness. Topamax caused tingly fingers, toes, lips and nose, sour stomach, weight loss and moodiness. 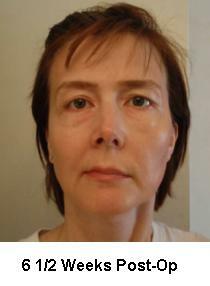 In August 2006 I received five injections of Botox – three in the upper eyelid, one below the eye and one in the cheek. This was not a positive experience for me. I was unable to blink, which caused severe dry eye, bad enough that my ophthalmologist told me never to do Botox again. Fortunately, I could still close my eye to sleep. Although my upper eye was frozen, I could feel the spasms strongly in the lower part of my face, though I think they were less noticeable to others. The upper lid spasms moved into my forehead and caused what I fondly call my “Botox wrinkle” above my left eyebrow. The drug that gave me the most relief was Tegretol 200mg 4x daily, which calmed but did not stop spasms. The effect began wearing off sooner, so I switched to Carbetrol 300mg 3x daily. One side effect I noticed with Tegretol was forgetting words in mid-sentence and having to stop and think for a while before I could finish my thought. Many of my friends told me they thought it was just getting older and that it happened to them too, but it really seemed to me to be due to the medication. I would have been happy to have an MVD surgery almost from the beginning, but with my younger kids in school, my eldest starting college, and my husband in an evening MBA program, there was never a window of opportunity. Once my husband finished his degree in December 2007, we decided to wait until school was out for the summer to minimize disruptions to family life and maximize my recovery time. Our 20-year-old daughter offered to stay with her younger siblings, who would be going to day camps during the first three weeks of summer. Dr. Casey and I had been in contact via e-mail, and he thought the time frame was workable. I had requested an out-of-network waiver from our insurance company, which was approved with only a phone request and faxing my medical records. I could not believe how easy the process was. I started researching flights to Detroit, and found a Southwest Airlines special with $48 flights from St. Louis, if we could fly on a Tuesday or Wednesday. Since I would be seeing Dr. Casey for a consult on Friday, May 30, Phil and I decided to fly out Wednesday and spend a few days together. I went back to the Internet, because I wanted to surprise Phil with a few days at a bed and breakfast instead of checking in at Guest Housing right away. I found the Woodbridge Star Bed and Breakfast just a few minutes away from the Detroit Medical Center complex. I contacted the proprietors about the purpose of our stay and they offered us a medical rate that I could not refuse, and I booked the Deco Suite. Phil and I saw our eldest daughter off to her first day of “real” employment at a local day care, then dropped the younger kids off at Science Camp, ran a few errands and returned to camp to eat lunch with the kids. We left Jefferson City about 3:30 to spend the night at the St. Louis La Quinta Inn. We awoke relatively early to eat a quick breakfast in the hotel lobby, then took their shuttle to the airport. The flight left on time at 9:30 a.m. and we arrived in Detroit at 11:40, including an hour time change from Central to Eastern. We picked up our rental car and I gave Phil directions to the B&B. He didn’t get it when we drove up, insisting that it could not possibly be the hospital housing. Well, yeah! We were the first guests to arrive, so we got a tour of the entire beautifully restored house. After a short rest, we looked for something to do. Most of the art institutes closed early in the afternoon, but the proprietors suggested the Motown Hall of Fame, which was open until 6:00. We had a fabulous tour guide, Peter, a source of fascinating details and anecdotes who turned an average facility into an outstanding experience. Back at the B&B, we were looking for a place to eat. I was perusing a menu for Baile Corcaigh, an Irish restaurant and pub, when one of the proprietors mentioned that a B&B guest, Paddy Keenan, would be performing a Celtic pipes concert there that evening only. That clinched our decision. Dinner was just OK, very Irish (heavy on the taters), but the concert was fabulous. Paddy Keenan played with a local guitarist, along with the guitarist’s fiddler daughter and percussionist wife. They played so tightly that I would never have guessed that they were not touring together. Keenan kept up a fascinating commentary between and sometimes during songs describing the music, types of songs and instruments and growing up in Ireland. Alan, one of the B&B proprietors, is a pastry chef and his breakfasts are works of art. He grew edible flowers and herbs to use as garnishes. I had stuffed French toast with raspberries and Phil had an omelet. We had a short conversation with Paddy Keenan before leaving for The Henry Ford Museum. The B&B offered discount tickets for two of the three venues (museum, Greenfield Village, and F-150 production line tour). We spent most of the day at the museum, overwhelmed by the number of exhibits. The museum contains the rocking chair that Abraham Lincoln was sitting in when he was shot, the car that JFK was riding in when he was shot, and George Washington’s camp cot. I sat in the same bus seat that Rosa Parks refused to relinquish. In the evening we took a walk around the neighborhood, which contains beautiful architecture in various stages of renovation. I had an early consult (8:30) with Dr. Casey. The exam room was shabby, with chipping paint and a broken wastebasket. Dr. Casey was very professional, though, and we had a good conversation, going over the procedure and its risks. He views the whole thing less as major surgery and more as fixing a pesky problem and returning to normal life. He had very few post-op limitations, for example. He also told us that he does not do repeat surgeries, because he feels he does everything possible the first time. He took a look at my MRI films and spotted the compressions right away. I reminded Dr. Casey that I had not had a facial EMG, and he said we would do that the morning of surgery. He instructed us to be at Detroit Receiving at 7:00 a.m. Monday morning. In the afternoon, Phil and I decided to take the People Mover (light rail) downtown. We happened to be at the riverfront just in time for the Red Bull Airshow trials and watched several of the pilots perform their qualifying runs around and between pylons set up on the river. They are insane! We talked to a couple from Buffalo who had come in to see their son, a mechanic for one of the pilots. Later that evening we saw them interviewed on the local news. If we had stayed 15 minutes longer, it could have been us, but instead we rode the People Mover all the way around its loop and returned to the B&B. We spent the day back at The Henry Ford, this time at Greenfield Village. As with the museum on Thursday, we found it fascinating, but too much to absorb in a single day. Highlights included Thomas Edison’s Menlo Park laboratory and making candlesticks in a machine shop. During our entire trip I had been hoping for a decrease in spasms as reported by many HFS patients just prior to their MVD surgery. However, it did not happen. My spasms came and went at random intervals, just like always. Phil and I had dinner at (delete: a brewery) Royal Oak Brewery. I finally had a chance to indulge in a bubble bath in the copper soaking tub, and the proprietors kindly sent up a bottle of champagne to celebrate our last night in the B&B. When we checked out of the B&B, Alan gave us a care package of pastries and tea to take with us. We attended the communion service at Historical Trinity Lutheran Church, a beautiful cathedral near downtown. We had a little time before and after the service to explore the church, but not nearly enough. After church we checked into Detroit Medical Center Guest Housing. It was quite a letdown after the B&B. We had requested a suite with a queen bed, but got one with twins. Phil is very tall, and the beds were short. There were several little nuisances: the cover fell off the a/c, the overhead light in the bedroom did not work, and the kitchen countertops and cabinet doors were chipped. But it was clean, convenient and cheap. There was wireless Internet access only in the coffee shop on the first floor. We checked our e-mail and changed our flight home from Tuesday to Saturday, since my post-op appointment would be on Friday. The tickets were more expensive, but savings in lodging expenses offset the difference. I was expecting a phone call from the surgery unit with pre-op instructions, so I kept my cell phone with me on a visit to Fort Malden National Historic Site of Canada. I did not receive any phone calls, so I did not eat anything after a lunchtime banana muffin from Alan. The fort was fascinating. It was interesting to hear about the War of 1812 from the British rather than the American viewpoint. There were some re-enactors, college students on summer break, who demonstrated life at the fort. One young man fired his musket for us. On our return trip to Detroit we ran into traffic from the Airshow. We spent about an hour at a public park in Windsor, Ontario, where there was a Shakespeare play being performed. Then we spent another hour and a half trying to cross the tunnel. I called the surgery unit when we returned to Guest Housing, and found I could eat or drink up until midnight, but I had no appetite and decided to go to bed early. Phil and I woke up early. Phil ate breakfast while I took a shower, then we called the shuttle to take us to the hospital. Upon arrival I spoke with several nurses, residents, and the anesthesiologist. Although I tried to make mental notes, I don’t remember any of their names. I still had not had a baseline facial EMG and the decision was made to do it after I was under anesthesia, with the understanding that if it did not indicate HFS, the surgery would be scrubbed and they would wake me up. 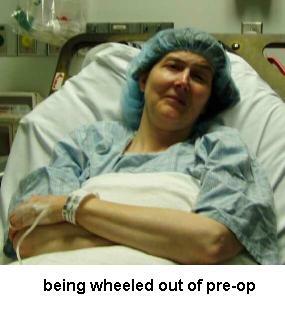 The last thing I remember was being wheeled out of pre-op. When I woke up I knew immediately that the left side of my face was weak and my spirits plummeted. Dr. Casey asked me how I was feeling, and I said “My face is weak.” He said, yes, my facial nerve was unhappy from the beginning, and we would talk about it the next morning. Then I started throwing up, and could not stop. I do not remember being moved from recovery to ICU, but I do remember heaving and heaving and heaving some more. My nighttime ICU nurse was very kind. She came into my room even before I pressed the call button because she noticed my heart rate increasing and figured I was about to be sick. I remember thinking that was the first time someone had actually held my hair back for me because I was going to be ill.
Dr. Casey came by early. He told me that he had padded off two arteries and half a vein before he felt he had to stop. He was unhappy about the facial weakness and told me that my biometric readings were the same at the end of the surgery as the baseline, so he had no explanation. He mentioned again that my nerves (this time including the auditory nerve) were unhappy and he had a “bad feeling” about them. He ordered some eye drops and showed me how to tape my eyelid for sleep. Later he talked to Phil in the hall about facial reanimation surgery involving nerve grafts as a future possibility. My ICU nurse from 7 a.m. to 7 p.m. was named Sara. She and I figured out that morphine was probably contributing to my nausea, so we tried a less potent painkiller instead, interspersed with nausea medication. The dry heaves continued but diminished. An aide came in with a breakfast tray, and I sent it right back because I knew that eating would make me throw up again. Sara brought me ice chips because my mouth was very dry. She thought graham crackers might help my nausea, but I did not have enough saliva to swallow them. I couldn’t drink from a straw, so I sipped apple juice as best I could. About midday, Sara and I agreed on a plan to get a commode into my room, then remove my Foley catheter and get me up and walking. She called housekeeping, which promised to send up a commode as soon as possible. All the rest of the day we waited. I dozed off and on, and Phil left to get something to eat. At one point I awoke to hear nurses in the hall discussing the need to call a man immediately because his wife’s systems were shutting down and he needed to get there quickly to say goodbye. In my groggy state I started to panic that they were talking about me (after all, Phil was gone), but as I more fully awakened I realized they were discussing another patient. When Phil got back to the hospital we called the kids and I spoke to them for a very short time. Our cell phone reception was not very good and it was hard for them to understand my speech. I was still nauseated off and on. Though it was not as bad, I still could not eat lunch or dinner. The commode still had not shown up by the time Sara left at 7:00 p.m. My new nurse was Kris. He and his wife both worked at Detroit Receiving and commuted from Canada. He liked working ICU because three 12-hour shifts per week was full-time. Because we were still waiting for the commode, Kris offered to move me into a larger room with its own bathroom. It turned out to be the resident crash room and also had a TV and a phone with unlimited long distance, although we did not use either amenity. I noticed a low-key buzz in my left ear, but thought it might be the hospital equipment. Kris got me out of bed and into a chair, and was supposed to make arrangements with a female nurse to remove my catheter, but the ICU became very busy that night, and another patient occupied him for a very long time. It was 11:30 by the time my catheter was finally removed, and Kris helped me to use the commode, which had finally arrived. Brain surgery has a way of removing any vestige of modesty that might have survived three childbirths. Phil was exhausted and went back to Guest Housing, and I slept fitfully. My calves had been very sore from the time I moved to the chair and were quite painful. Kris found a pump for the compression stockings and that helped. Dr. Casey came by early and removed the tape from my scar. He had a bigger group with him that morning. He said I would move to a step-down unit, but at that time there were no openings. My new nurse was Carrie, a pretty young woman with a nose stud. I picked at breakfast, but the sausage tasted too salty and the pancakes were both too doughy and too sweet. Carrie and Phil helped me take a shower and wash my hair. It was quite a production. They got almost as wet as I did. Carrie said she did not give many showers since most ICU patients are too sick, so it was a nice change of pace for her. It felt great to be clean, but the shower stung my left eye, which of course I could not close. I finally got the courage to look in a mirror. My appearance was pretty bad, but not as bad as I thought it would be. Phil said that my face had looked much worse in the recovery room, nearly flat and waxen. I was glad to have waited. Once I got past that first look in the mirror, I started using the bathroom rather than the commode. Phil and I took a couple of walks in the hall. I picked at lunch, cutting up some lukewarm turkey breast to put on the wilted salad, but gave up. (Just so that you know, the menu professed green beans, but the turkey was served with spinach – the icky smelly kind that used to come with school lunch.) That afternoon, the head of food services came to visit me and asked me what was wrong. I told him that I had no appetite, that I was afraid of becoming nauseated again, and frankly the food wasn’t all that appetizing. He said he thought it was pretty good for hospital food, I allowed that maybe it was, and he left. I don’t know if he visited all the patients, or a random sample, or if it was due to the fact that I hadn’t eaten hardly anything. There were still no rooms available in the step-down unit. Phil and I decided that I would do just as well moving back to Guest Housing, so I asked to check out. It took a couple of hours to get discharge papers together, arrange for prescriptions, and remove my IVs. Back at Guest Housing I napped, drank a little juice, called the kids again and went to the bathroom all by myself. Although I couldn’t hear much on the left side, the buzz in my left ear was much louder. It sounded like a lawnmower circling a tree. I finally figured out that the trick to drinking with a straw was to keep it in front of instead of behind my teeth. Once I started to take in more liquid I began to feel much better. I ate some grapes and sliced banana, but the thought of Alan’s leftover pastries was too much, so Phil got to finish them. I napped, went downstairs to check e-mail, and searched for information about facial reanimation surgery. There were some very impressive before and after shots on some of the websites, and I started to feel a little better knowing that there were options if my nerve does not heal. Phil and I took a field trip to the Eastern Market area, but I got tired very quickly and my eye hurt from being outside, so we returned to Guest Housing. I ate a little more fruit and some cheese and Phil and I wrapped up the day by watching one of our favorite movies, The Princess Bride. My post-op appointment was scheduled for first thing this morning. Dr. Casey was late returning from rounds, so we had plenty of time to contemplate the broken wastebasket. Dr. Casey was truly distressed about my facial paralysis and said he did not consider my surgery to be a success because of it. I asked about my chances for recovery. Dr. Casey said that about 10% of MVD patients experience facial weakness immediately after surgery, and of those, 10% have permanent paralysis (for a 1% overall risk). Again, he said he had a bad feeling about my case. I asked about the timetable for facial reanimation surgery. He said after three months, and also said that I could return to Detroit and he would do it, or I could have it done at the University of Missouri at Columbia by Dr. Scott Litofsky, whom I should also consult if I experience a late CSF leak. I asked what a CSF leak would be like, and Dr. Casey responded that it would be obvious to Phil, that a watery fluid would be running from the incision site. Dr. Casey held a tuning fork up to my right ear, which I could hear fine. He then held it by my left ear and I could not hear a thing. He placed the tuning fork directly against my skull, and I could hear it then. I assume the sound was conducted through my skull. He said the tinnitus I noticed was very common and was the sound of blood vessels inside my ear. It might or might not go away. Dr. Casey gave me information about moisture chamber glasses from Pan-Optx, and recommended Refresh Endura eye drops and a gentle tape for my eyelid. He asked me to arrange to have my stitches removed in ten days to two weeks, an Audiogram at six weeks, and a facial EMG and ENoG at two months post-op. He instructed me to take a pain pill at the airport, but not until after we had gone through the security checkpoint so they would not think I was impaired. He asked me to keep in touch via email and wished us well. One of the office assistants was kind enough to fax the information about the goggles to our ophthalmologist in Jefferson City. We stopped off at the professional building pharmacy, but they did not have eye drops or tape, so we drove to CVS, where we also bought ice cream to make milk shakes. On our trip back to Guest Housing our ophthalmologist called. He had received the fax about moisture chamber goggles and agreed to order a pair. Phil and I decided to call the kids to let them know we would be home early instead of surprising them. I enjoyed my milk shake, watched Karate Kid II with Phil, and went to bed. I was terrified at the thought of boarding an airplane and flying home. I had not slept through the night since before surgery, my head hurt and my ears felt full, especially, of course, the left one. I had no idea what a pressurized aircraft was going to do to me. I showered and packed while Phil stripped the beds and collected towels. When we checked out we asked the desk clerk what to do with our leftover food. She suggested offering it to the cleaning lady, so we left a note for her. We drove to the airport, turned in our rental car and rode the shuttle to the terminal. Once in the airport, I asked the ticket agent about early boarding. She was amazed that I was traveling five days after brain surgery, and told us to ask at the gate. I took a pain pill just before we went through security, figuring it wouldn’t impair me all that quickly and wanting it to have plenty of time to take effect before the flight. Everything went smoothly, and Phil had no trouble getting us a disability pre-board. I was unable to sleep on the plane, despite taking a second pain pill, but between the medication and chewing gum at takeoff and landing, I did all right, though I had to use lots of eye drops. Phil sat on my left, which was a tactical error since I had to turn my head around to hear him. We took the hotel shuttle to the airport where we had left our truck, and drove the two hours home. We arrived before the kids, who had gone to a movie with their uncle. My mother-in-law had left a beautiful hanging basket with pink petunias on the front porch, and there was a batch of get well cards in the mailbox. The kids arrived home shortly after. We were all happy to be together again. The kids had presents for me, and we gave them their souvenirs. A family friend had brought them a spaghetti dinner the night before and I had leftovers, the first real food I had eaten since Sunday morning. The kids demonstrated our new Wii system and showed me the Wii they had created for me. Phil set up the Wii Fit board and we all did the fitness evaluation. It comes up with a “fitness age” based on height, weight, and a balancing activity. I was quite surprised to come up with the best fitness age, 14 years below my chronological age. This indicated that my balance was unaffected by the surgery. Phil gave me an eye patch that he had worn as part of a pirate costume during a chili cook-off. It was from the pharmacy so it was properly shaped to stay off of the surface of my eye. That night I began using the patch instead of taping my eyelid — much better. Phil took the kids to church while I stayed home. It was great to sleep in my own bed, and sleep I did. I slept, got up, ate a little something, went back to sleep, and then repeated the process. When I went to the bathroom and looked in the mirror, I noticed some contouring in my left cheekbone and a very faint nasolabial line that had definitely not been there the night before. I slept a lot more at home than I had in the hospital or at Guest Housing. I never did have a problem with constipation, but the nurses encouraged me to take stool softeners anyway. Maybe it was that, maybe it was finally eating again and maybe it was a little of everything, but whatever the cause, I had a bad case of diarrhea all day long. Sleeping so much during the day wreaked havoc on my nighttime sleep, but last night I woke up just twice. Phil asked me to go to Lowe’s with him, my first time out since arriving home. I called my parents and my sister and had short conversations with them. I was very tired. Last night I woke up only once. Phil returned to work today and I had the house to myself. I caught up on newspapers and jotted some notes for my MVD diary. I limited myself to just one afternoon nap so that I would sleep better at night. Phil brought home the moisture chamber goggles that our ophthalmologist ordered. They were not the Pan-Optx glasses that we expected. They were big and white and ugly and looked more like sport goggles than sunglasses. I didn’t like the way they looked, but they did help my eye feel a little better. I wore my styling new goggles to church. I spoke with a few persons but left before Sunday School. Our middle daughter was attending basketball camp, and a friend picked up our son for swim lessons. I decided to do one small household task every day because I was tired of sitting around doing nothing. Today I cleaned the front hall closet. It took all day because I took frequent breaks, but I got it done. In the evening, I got a phone call from a friend and former coworker who was on my e-mail update list. 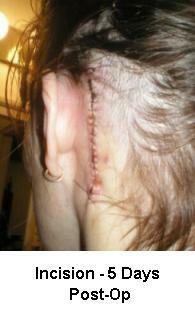 She had a brain tumor removed in 2000, shortly after the birth of a son. She had facial weakness as well, and had to wear a patch for six months. Her speech was affected much more than mine, but over the past eight years she has had a full recovery and is now considered cancer-free. It was very nice to talk to her, and reassuring that she had such a positive outcome. In the morning I programmed a new cordless phone system for the house. In the afternoon I drove my son to the mall so that he could buy a Wii game at the used electronics store. I had no problem driving, but outside my eye was very dry and uncomfortable even with the moisture chamber goggles. I switched to the pirate patch inside the mall. My son had no problem with that, probably because he was so eager to buy the new game. Today I was scheduled to drive to Columbia with a friend to pick up our daughters from basketball camp. When I took off my eye patch in the morning, I touched my incision and found it wet between the stitches and the back of my ear. I blotted the area with a tissue, and it looked like water mixed with a little blood. My first thought was that it might be a CSF leak. Dr. Casey had said that a leak could resolve itself over a couple of days, my appointment to have the sutures out was scheduled for the next day, and I was afraid that the doctor might tell me not to go to Columbia that afternoon. So, I was leaning toward not doing anything until the next day. But at the urging of some members of the HFS support group, I made an appointment to see my doctor late in the morning. She removed some heavy scabbing from the top edge of the suture line and told me that it was serous fluid draining from the wound. She recommended leaving the sutures in for another 48 hours, so I cancelled the Thursday appointment and made one for Friday. My hearing had not been bothering me at all during day-to-day activities, but that afternoon at Mizzou Arena, my hearing loss seemed pronounced. I had a very difficult time hearing the announcements with all of the background noise and echoing. I did notice that the tinnitus in my left ear had disappeared, and I could not remember if I had heard the lawnmower sound since I returned home. My Pan-Optx goggles arrived today. The company is now called 7EYE . Their goggles are pricey, but they have some closeouts that are more reasonable. They look and feel better than the white goggles. Now that I have been off Carbetrol (time-release Tegretol) for a couple of weeks, I am no longer forgetting words in the middle of a sentence. I knew it was due to the medication! I returned to my doctor to have my sutures –- suture, actually – removed. My doctor told me the wound was closed with a single running stitch. She also removed a different type of suture from a lower level, and said that more of those stitches may work themselves to the surface later. My scar is wider at the top where the heavy scabbing was, but it will be covered with hair so it doesn’t matter much. Phil told me that during the night he felt my eye twitch. He described it as “boom, boom, boom, then it was over.” He said it brought him wide-awake and he couldn’t sleep for hours afterward. I hoped he had imagined it, since I was wearing the patch and my eye was not in direct contact with his shoulder. It never happened again. I had an appointment today to be fitted for a BlinkEze external eyelid weight. My ophthalmologist had ordered the fitting kit with overnight delivery because he was going on vacation the next day, and he did not want me to have to wait until his return the following week. As I was getting ready for the appointment, his office called and said he had left with the stomach flu, and we would have to reschedule the appointment to July 8. Neither of his partners was comfortable doing the fitting. For the first time since my surgery, I cried from disappointment. Today I asked Phil to fax Dr. Casey’s request for follow-up ENoG and facial EMG tests to my local neurologist, who declined to do them with the explanation that the tests were uncommon and he did not want to subject me to uncomfortable tests that might not be done correctly. He also said that nobody in Columbia, including Dr. Litofsky, did these tests. I found that hard to believe. If Dr. Litofsky does facial reanimation surgeries, he must need access to those tests. I was very disappointed in my neurologist. Even if he did not want to do the tests, I think he should have helped me find someplace else to have them done. I decided to search the Internet for “facial EMG Missouri” to find a place to have the tests done. The search turned up the Facial Nerve Center at Washington University in St. Louis, dedicated to patients with facial paralysis. Due to the Independence Day holiday, I had to wait until the following Monday to call for an appointment. I contacted the Facial Nerve Center at Washington University first thing in the morning and waited most of the day for a callback. 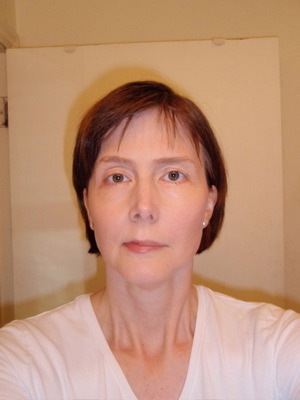 The clinic director is Dr. J. Gail Neely, an otolaryngologist. The first available appointment is Tuesday, July 29, but Dr. Neely may want to bump it up. I finally met with the ophthalmologist to be fitted for an external eyelid weight. He sent me home with two different samples to try. The weights do work. I could blink! They are hard to attach though, because to close my left eye I have to close the right one, and then I have to try to place the weight by feel. I met my exercise buddies for coffee, my first social outing. I wore the shiny test eyelid weight. I picked up my own pink eyelid weight. It looks like a tiny Band-Aid stuck to my eyelashes. I wore the eyelid weight as much as I could over the weekend. It is relatively heavy at 1.6 grams, and tends to slip down over time. The adhesive strip is smaller than the weight, which contributes to the problem. I am blowing through the initial supply of 100 adhesive strips. An Audiogram today showed low-frequency hearing loss on the left side. My left side speech recognition measured 85% at conversational level, dropping to 64% at a higher volume. I tested at 100% on the right side. My eardrum is functioning normally. The audiologist recommended a follow-up in a year. I spoke with a customer service representative about my eyelid weight concerns. Management is to call me back in the next couple of days. I have stopped wearing my eyelid weight and have been keeping Refresh PM on my left eye during the day. It makes my vision blurry on the left side, but my right side compensates and I can see well enough for day-to-day activities, including driving. I called Med-Dev customer service again, and the customer service representative sent me some information about alternative adhesives. They would require a prescription from my ophthalmologist. I forwarded the information to him. Here is my appearance at six and a half weeks post-op. Not much happened, face-wise, over the past ten days, so I did not keep notes for my journal. I have talked with three different friends who had episodes of Bell’s Palsy and recovered fully. Friends have told me that I look much better. I think it is harder for me to see improvement because I see myself every day and don’t see small changes, while they may see me once a week and the difference is more noticeable. I do know that it has become easier to open my mouth to eat or brush my teeth, I do better drinking from a cup, it no longer hurts to yawn, and my speech is better. I went to a family dinner July 20 to celebrate my brother’s 50th birthday. That was the first time my parents, brother or sister saw me. My sister said that my face wasn’t as bad as she had expected from my descriptions. I skipped my high school reunion last weekend. Today I finally went to the Facial Nerve Center for tests. I had a facial EMG followed by an Audiogram, tympanogram and auditory brainstem response test. The EMG results were not encouraging. The technician and resident performing the procedures did not see any signs of regeneration. They kept focusing on my nose trying to decide if they could see movement or if it was direct stimulation from the shock. They did some repeat shocks to be sure, but in the end decided that it was stimulation and not movement. The Audiogram was nearly identical to the one I had two weeks ago – low frequency hearing loss and speech discrimination at 84% on the left side. I met with Dr. J. Gail Neely, an otolaryngologist who heads up the Facial Nerve Center. Best news first: Dr. Neely thinks I have a good chance of regaining full hearing. He also saw the slightest of movement on the left side of my nose and lips — enough to score a whopping 12 (out of 100). He thinks that I will, over a long period of time (12 – 18 months post-op) regain a significant amount of movement, but I won’t return to normal. He thinks I can expect about a III on the House-Brackman scale. If I am not satisfied at 18 months, we will talk about surgical options. Synkinesis is pretty much a given, but I will work with physical therapists when the time comes. I see Dr. Neely again in four months, just before Thanksgiving. I like Dr. Neely. He seems both knowledgeable and empathetic. I’m happy to have found him, especially after being cut loose by my neurologist. In two weeks I return to St. Louis to see Dr. Philip L. Custer, an ophthalmologist who works with many of Dr. Neely’s facial paralysis patients. Dr. Neely says he is very good at determining what patients need in terms of eyelid inserts and other minor nip-and-tuck procedures. The external weight is not working well for me because my upper lid is droopy and pushes the weight forward into my field of vision. It’s a great concept, though, and if it worked for me I would prefer it to an implant. I had an appointment today with Dr. Custer. He thinks I have three basic choices (other than not doing anything). First is taking some stitches at either corner of my eye to make the exposed surface area smaller. The second is a weight implant, and the third is an eyelid spring. He considers only a handful of surgeons nationwide are competent to do the eyelid springs, and even they have a 25% complication rate within the first year. He does not think stitching would be optimal for me. I have no desire to go elsewhere for surgery, so we focused on weights. Dr. Custer uses platinum weights exclusively because there are fewer complications with reactions to the metal. I asked about platinum chains. He said he would order one if I was insistent, but he does not think the benefits outweigh the increased cost. He also thought the design would make it harder to remove later on because tissue would grow into the spaces of the links. I asked how we will know when it’s time to remove it. He said when I get movement back in my forehead, but warned me that I would want it out before he is willing to remove it. 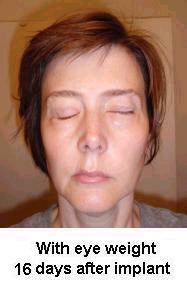 Sometimes patients will get some eyelid movement back but not enough to get along without the help of the weight. It is possible that I will have to downsize the weight rather than take it out altogether. Dr. Custer has an opening in his surgical schedule tomorrow afternoon and I’d like to have the procedure done before school starts, so I took it. It’s an outpatient procedure under local anesthesia. He said I could expect to be sore for a couple of days, and black and blue for up to a month. Risks are infection, shifting after insertion, and extrusion through the eyelid. He says I have thin skin so I will be at increased risk for extrusion, but he will place the weight under as much tissue as possible to minimize the risk. After the appointment, I took my kids to the St. Louis Zoo. It was a perfect day for it, breezy and warm, but not hot. It was a nice wind-down to the summer. Phil could not take a day off work at such short notice, so my friend Debbie drove me to St. Louis. I was supposed to check into the surgery center at 1:30 but when we arrived at 12:50 the receptionist told me that I was Dr. Custer’s last patient of the day and they were waiting for me. She gave me some papers to fill out and gave Debbie a pager. I would have thought that the process would go quickly since they were waiting on me, but that did not turn out to be the case. Registration did not take long, but then we waited nearly an hour before the nurse called me back. I changed into a HUGE paper gown about three times my size and answered questions for the nurse. She apologized for the delay and gave us alternative traffic instructions back to Jefferson City that would not take nearly as long. Dr. Custer came in and apologized again for the delay. He still had two procedures ahead of mine, but they were all short. He was able to get a second OR that should speed things up. The anesthesiologist came in and started an IV. About 2:40 the nurse and I encouraged Debbie to go get some lunch. The nurse thought that I would be in the Operating Room pretty soon and the procedure would last about 20 minutes, so Debbie would be getting back about the time I was in recovery. Debbie left and I waited. Dr. Custer came back in with the sizing kit and decided on a 1.8 gram weight, one size up from my external weight. That’s relatively heavy, but gave me complete closure. He said that the internal weight might not give complete closure, but he still felt it was the best fit. Dr. Custer left and I waited. Debbie came back about 3:45, surprised to find me still waiting. The nurse was surprised it was taking so long as well. Debbie was planning a surprise party for her husband, so we chatted about that for a while. At one point we were talking about the number of cakes she should order, and she switched to talking about the number of kegs she should order, while I thought she was still talking about cakes. The resident was very amused by our conversation. At 4:40 the anesthesiologist returned and we were ready to go. She gave me a sedative and I was rolled to the Operating Room. I scooted over to the operating table and Dr. Custer started the procedure. I don’t think it took any longer than 10 minutes. He was explaining the risk of extrusion to the residents and they started joking about the creature popping out of the guy’s chest in Alien. (Fortunately an extrusion would be nothing like that.) All I had to do was focus on Dr. Custer’s finger once in a while. Once in the recovery room the nurse brought me some juice and graham crackers, very welcome since I had nothing to drink since 11:00 the night before. Dr. Custer popped in to see me and told me he was very pleased with the outcome. The nurse got me an ice pack for my eye, brought me some antibiotic cream and oral antibiotics from the pharmacy, went over discharge instructions with Debbie and me, and fetched my clothes. Debbie went to find the car and I was wheeled out to meet her at the curb. At 6:00 we were finally headed home. I was fine for the first half of the trip, then became very sleepy. I stayed awake for the whole trip, however. The nurse had given us good directions and we rolled up to my house at 8:15. My husband and kids were very happy to see me. Phil felt badly about not being able to go with me, but was glad that Debbie had been able to go and that things turned out so well. I sent out a e-mail that I was home, and got ready for bed. Even sore and puffy, I can tell that my eye is much better. My face, even the paralyzed side, looks less tense, for lack of a better description. Dealing with dry eye must have been more stressful than I thought. I wish I had had this procedure weeks ago. I am keeping my eye iced today. I received an eye-mask ice pack in recovery. I cut it in two and duct-taped the cut edge so that I can keep one in the freezer while I use the other one. My eye is not badly bruised today, but will probably become more colorful over the next few days. The kids and I ran up to Columbia to do some shopping. My eye got very dry and sore on the drive back. By the time we arrived at home, I was ready to slather on some ointment and slap on a pirate patch. But there was a package from amazon.com in my mailbox. Nearly a month ago I ordered a pair of RSVP Onion Goggles recommended at a dry-eye website, but they ended up on back order. I decided to try them out, and slipped them on after putting in some eye drops. They are seriously helpful! The foam lining intended to keep onion fumes out, keep moisture in. The goggles are clear so they are suitable for reading, computer work and other indoor uses. Onion Goggles come in pink, white and black with a green stripe. I bought a pink pair, and found out that part of the purchase price is donated to breast cancer research. They do look a bit dorky, but less so than an eye shield or pirate patch. And these days, eye comfort is trumping fashion big time. Dashed to St. Louis (after picking up my kids from their first half-day of school) to see Dr. Custer for a follow-up. I managed to get there a little early, but ended up waiting in the exam room for a really, really long time. Apparently an elderly gentleman has a mass of some sort in one of his eyes and he and his family had lots of questions. Those paper-thin exam room walls don’t have much respect for HIPAA, I’m afraid. The office manager did drop in a couple of times to apologize, and asked if they had done my surgery just last week. I said yes, and she said I looked great. A few other people popped in to look as well. Apparently not too many implant patients get away without a black eye. Once Dr. Custer finally got to me, he said I am healing very nicely. The stitches have almost completely dissolved. My lid shuts at most halfway during a blink, but almost completely when I close my eyes. He thinks it may still improve as I heal, but the only option he sees at this point would be to remove the weight and put in two smaller ones, because I have the largest platinum one (1.8 grams). Or he can stitch the corners of my eye to bring the top lid down. He is not keen on doing more surgery on me as long as we are hopeful that I will be regaining movement. I am not keen on additional surgery either, especially the double-weight idea. We also talked about acuity. My vision fluctuates a lot during the day, depending on how dry my eye is. Since I am using the antibiotic ointment, it is blurry most of the time. Dr. Custer said that last week my right eye measured 20/25 and my left 20/30. Yesterday my right eye was still at 20/25 but my left measured 20/200. That improved to 20/50 through the little pinhole viewer. He could see the layer of ointment on my eye and said it was like trying to focus a camera lens with Vaseline on it. He would like for me to keep using ointment as long as I am able to tolerate it, because he thinks it is best for my cornea. I need to keep using the antibiotic ointment for the next few days, then return to Refresh PM. I will see Dr. Custer again in about a month. Then I made a quick stop at Trader Joe’s — love that store — and dashed back home noshing on little licorice scotties. I went to the gym today for a short workout, the first since my surgery. I had been away so long that I needed to have my account reactivated. On the plus side, even though I have been a slug all summer long I have not gained any weight. My workout buddies were all happy to see me and told me that I look great. A bald-faced lie, but it was nice to be back. Unfortunately, now that I am able to get back to the gym regularly, my facility is shutting down for a week of maintenance. Today marks three months post-op. I am doing pretty well. The eyelid weight, while not returning function to normal, helps a lot. My eye opens completely, closes mostly and blinks about halfway. I am still wearing a patch at night, but could probably give that up pretty soon. The facial weakness continues, with minor improvements. For the past few days, first thing in the morning when I look in the mirror, I think that my lower lip looks fuller on the left side and my philtrum (the very cool anatomical term for the depression between the nose and mouth, made up of a philtral dimple and two philtral ridges) is straighter. Within about ten minutes, though, my face is pulling toward the right again and stays that way for the rest of the day. According to my ANA pals, this is a baby step toward recovery. I can drink from a cup now, and a bottle with extreme concentration. My speech is good, even my son’s speech therapist says so. My kids tell me I was nearly impossible to understand on the phone right after surgery. I have started going to the gym again. I have dropped my weights way back, both because I took the summer off and because I want to avoid Synkinesis due to straining. Fortunately I have not gained back the weight I lost after surgery. A few people have been surprised to see me and ask what happened to my face. Most people, though, have taken it in stride. I have yet to encounter staring or rude comments in public. My kids and their friends have been fabulous. I have made some changes to my activities and lifestyle, but overall life is slowly returning to normal. I promised Jack that I would always post an update on my birthday, and today’s the day. I suppose that I should go ahead and declare myself “SPASM FREE”. (Happy Birthday to me!) I have a lingering fear that as my facial function returns, spasms may come back as well, particularly given the fact that Dr. Casey had to leave half a vein unpadded. Dr. Neely did not think there is much chance of the spasms returning, but there is no guarantee. If spasms recur, I will not have a second MVD. Had I known ahead of time that I would experience prolonged facial paralysis, I would not have had a MVD at all. 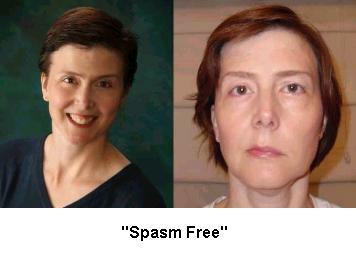 It is nice not to have spasms, but waking up every day with facial paralysis is for me, much worse. I do not think Dr. Casey could have done anything differently, I just happened to fall on the wrong side for this risk. I am still praying for a miraculous complete recovery, and I invite anyone so inclined to do the same. Dr. Casey and I still correspond by e-mail. Even though I am no longer in his care, he is genuinely concerned with my continuing progress and says his office will continue to follow-up with me until I am sick of hearing from them. There are a couple of great websites for people with persistent facial weakness. One is the Bell’s Palsy Information Site. You have to join the forum to view posts. The other is for the Acoustic Neuroma Association . Since acoustic neuromas often surround the facial nerve, a higher percentage of ANA patients suffer facial paralysis following surgery. They were very welcoming of me even though I did not have a AN. The ANA forum is completely available to guest users. I will post updates as major changes occur, but I think it is time to publish this diary now so that my experience is available to others sooner rather than later. Anyone with questions is more than welcome to contact me privately. My update is coming a little earlier than expected. Jack kindly sent me my diary for review, then during a cleanup of my desk for a Christmas party, I misplaced the thumb drive with my edits. Today I gave up the search and did the whole thing over. Quite a bit has happened since September. I saw Dr. Neely for a follow-up just before Thanksgiving. My facial function score increased from 12 to 46 (moving me up from a V to a IV on the House-Brackmann scale). Dr. Neely said that my cheek was trying to move, but wasn’t there quite yet. I see him again in March. I saw Dr. Custer for a follow-up right before Christmas. My eyesight is still good under all the ointment, but it was a little drier than he would like. He says I get good closure, but it takes a little time for my eye to drift shut. He asked me to try to train myself to shut my eye completely every minute or so since my blink is not there yet. He also instructed me to run a humidifier in my bedroom when I sleep. I don’t know if it is helping my eye, but the house plant in my office is sure loving it! I see Dr. Custer again in April. Seven months post-MVD and spasm free. And meanwhile, life goes on. My father-in-law passed away suddenly in October. My mother-in-law does not drive, so I need to be available to take her to shop and run errands and see her doctors. My father had heart surgery in August and has not bounced back to anyone’s satisfaction, and I am trying to relocate him and my mom to the town where I live. My eldest daughter is in college and my younger two are deep into the school year, activities and friends. There are things to do, places to go and people to see, and there just isn’t time to dwell on my face. So like most everyone else in the world, I get up in the morning, go out and do the best I can. Again, please feel free to contact me privately if you have any questions, particularly concerning facial paresis following MVD. Permission granted the HFSA to post MVD Diary on website.